Exciting News About Goodreads: We're Joining the Amazon Family! When Elizabeth and I started Goodreads from my living room seven years ago, we set out to create a better way for people to find and share books they love. It's been a wild ride seeing how the company has grown and watching as more than 16 million readers from across the globe have joined Goodreads and connected over a passion for books. 3. Amazon supports us continuing to grow our vision as an independent entity, under the Goodreads brand and with our unique culture. It's important to be clear that Goodreads and the awesome team behind it are not going away. Goodreads will continue to be the wonderful community that we all cherish. We plan to continue offering you everything that you love about the site—the ability to track what you read, discover great books, discuss and share them with fellow book lovers, and connect directly with your favorite authors—and your reviews and ratings will remain here on Goodreads. And it's incredibly important to us that we remain a home for all types of readers, no matter if you read on paper, audio, digitally, from scrolls, or even stone tablets. For all of you Kindle readers, there's obviously an extra bonus in this announcement. You've asked us for a long time to be able to integrate your Kindle and Goodreads experiences. Making that option a reality is one of our top priorities. This is an emotional day for me. 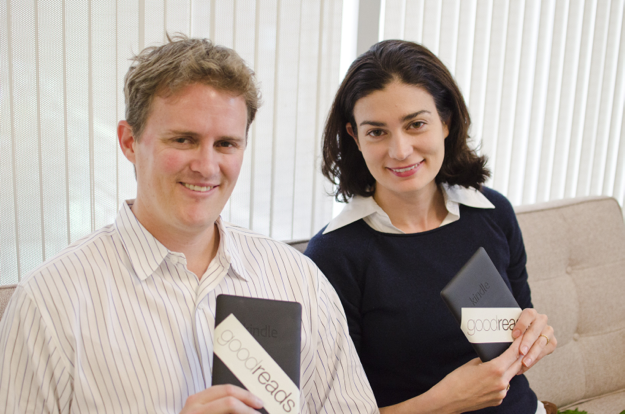 Goodreads is more than a company to me – it's something that Elizabeth and I created because we wanted it to exist. Since then it has grown a lot and become a place we love working at, full of incredibly smart and passionate people who also believe in our mission. I feel a little like a college graduate – happy to come to this milestone, nostalgic for the past amazing seven years, and incredibly, incredibly, excited for the future. P.S. For the more official version of the announcement, here's the press release that went out today. P.P.S. Please let us know – what integration with Kindle would you love to see the most? Is it going to be required to use your Amazon login to get into GR, then? So I hope all the missing book covers come back to Goodreads?! I'm excited to not feel pressured to review and/or rate books on both sites separately. I'm assuming those will be integrated? Oh, I second Jacquie. That would be fablous to have the reviews linked! F***. It's not April Fool's Day. This is real!? Jacquie wrote: "for me, I would like to be able to post one review and have it go to both sites"
I'd like to be able to access/share Goodreads stuff from the Kindle directly to Goodreads and elsewhere, e.g. reading progress, content, quotes, author info, directly without leaving a page. Furthermore, I'd still love to find info on where to purchase a book as cheaply as possible, not restricted to Amazon. I get it, you need money. But I hope Amazon does not hinder the ability to buy books from other sites and prevent competition. This curious since Amazon already owns and neglects Shelfari. Now I know on Amazon your reviews are no longer your own, but Amazon's, does this mean that my reviews on GR will belong to Amazon? So another good site succumbs to the lure of the big name...I hope the original purpose of Goodreads won't be lost. If it is, I'll return to pencil/paper to record my reading. I'm with Nikki. Not happy about this news. Hoping NOTHING changes on Goodreads at all and agree with above about the star ratings etc. This sounds like exactly what I've been needing. I agree with Catherine. When I buy a book on Kindle/Amazon I'd like it to automatically get added to my to read or reading shelf (unless I click a box to not post it). I would also like for Kindle to include a feature that allows me to categorize my books (using my own categories, perhaps in addition to those set by kindle). It's tough to find a book I purchased last year if I don't remember the name. I'd also love to easily see what others are reading and buy a copy right then and there. This gives me a case of the sads. Sorry. Not excited about this. GR was great the way it was. I'm excited! I love Goodreads and I love my Kindle Fire. I would love to see my bookshelves inigrated or some type of bookshelf via a Goodreads app that will work with the Kindle. Only downfall of the Kindle Fire via the Nook Color is not being able to organize my books. Jennifer wrote: "Now I know on Amazon your reviews are no longer your own, but Amazon's, does this mean that my reviews on GR will belong to Amazon?" Hmmm. Congrats but I shall hold off on breaking out the champagne. Bye Bye Shelfari . . . Hello Goodreads!! I hope nothing changes with Goodreads. I hope Amazon merges my "To read" list with my Amazon Wishlist. I'm an amazon customer and certainly don't hate the company and I am happy that people who took the initiative to put goodreads together are being rewarded financially. That said, this news strikes me as sad. I liked/would prefer a community of readers not backed by someone with motives to a) unrelentingly mine my data and b) sell me stuff. Again, not trying to vilify or begrudging a financial reward to anyone, but this is not cheering news. This is fantastic news! I do hope that the site continues to run independently, as promised, but I suspect (hope) Amazon is smart enough to not want to mess with its success. But I'm definitely looking forward to better integration with Kindle and Amazon's web site. I'm on the fence with this. Amazon's Shelfari site is terrible and I avoid using it because of that, if they do something similar with GoodReads I will likely leave. Too bad the members were not clued on this decision. I would have paid a fee to keep this site independent. Now all I can do is wait and see. Last thing Amazon bought they killed off - Stanza by Lexcycle - it was one of the best mobile reader apps around. Very disturbing news after all the trouble with Amazon last year. What terrible news. Loss of an independent reader community, now another channel for the faceless machine to leech reader data to withhold from suffering publishers & booksellers. If through this account Amazon has a record of my reading habits I will be deleting the account. Very sad. Do you really think this a good idea? There was a reason why you stopped using the amazon data in the goodreads database. Not sure how I feel about this and I am an Amazon Customer. What I lOVE about GR is that it's truly crowd-sourced. Amazon is not a family- it's a profit making machine. Quoting Anne (message 33) "I liked/would prefer a community of readers not backed by someone with motives to a) unrelentingly mine my data and b) sell me stuff." Agreed. I would like that feature this way I don't have to review the same book twice! I really hopes this is true. I don't post reviews on Amazon for a reason. I am not sure I am happy with that announcement but we'll see. As an independent bookseller, I am very disappointed to see this as Goodreads stood out as one of the few book-oriented websites independent of Amazon. I will be deleting my account, and sad to see the information and connections I made go with it, but I can't support an organization I truly feel has nothing but it's own profits in mind and one which has done (and will continue to do) a lot of harm to the publishing business. Catherine wrote: "Feature Request: When I buy a book on Amazon I'd like it to automatically get added to my to read or reading shelf (unless I click a box to not post it, which I would do if it was something like a ..."
amazon has been very hands-on and overcautious with the way it treats its reviews and reviewers. will you at least tell us before you delete our reviews?? because they don't. I am so confused by this... didn't you have a huge break-up with Amazon not long ago the whole No Amazon Covers or Content now all that work was for naught? I don't shop at Amazon and stay as far as I can away from there so I for one am not very thrilled by this for GR to become kindle-centric. I have a Nook and don't want to add a Kindle version to my library just because you are now a part of the Amazon book Monopoly. I am curious, is there any estimate of when this will happen? I stopped receiving books with GoodReads. On another site, I paid a small lifetime fee and still receive them. Could that happen in the future with GoodReads? Will the 'review policy' change here? how about review culture? I avoid reviewing on Amazon because it seems to devolve into a giant flame war. There's enough of that on GoodReads already. I like that I can see what my favorite authors are reading and reviewing. Amazon bans authors from reviewing. Will GoodReads now ban authors from sharing their thoughts on books?